In a small (3-quart) sauce pan set over medium-high, add the cranberries and sugar and stir to combine. After several minutes, the cranberries will start to pop, releasing their natural juices. Add the chiles. Stir until all of the sugar is dissolved and cranberries have split open, about 10 minutes. Remove from heat and let cool. Add the jicama and salt, usually about 1/2 teaspoon, and stir to combine. Dribble 3 tablespoons of water over a clean kitchen towel, then wrap your cold tortillas in it (you can also use damp paper towels). Slide the package into a microwaveable plastic bag and fold the top over-don't seal it. Microwave at 50% power for 4 minutes to create a steamy environment around the tortillas. Let stand for 2 to 3 minutes before serving. 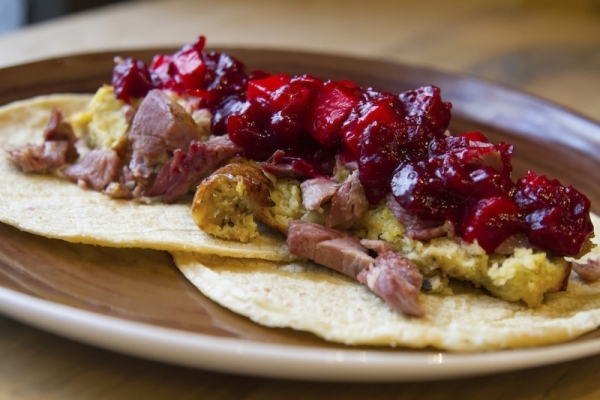 Scoop the stuffing and turkey onto a warm tortilla and top with the cranberry-chipotle-jicama salsa.